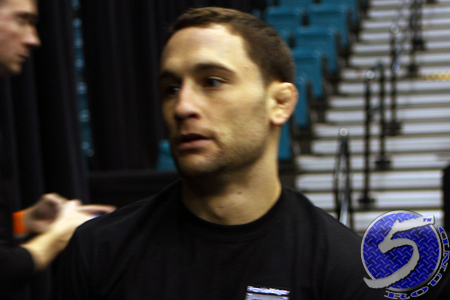 Not too many moons ago when Frankie Edgar (Pictured) was donning the lightweight title, UFC president Dana White said Edgar would get an immediate crack at the featherweight crown if he decided to enter Jose Aldo’s kingdom. However, after losing his belt to Benson Henderson at UFC 144 and failing to recapture the strap in Saturday’s rematch at UFC 150, White says Edgar would now have to post one victory in the 145-pound division before earning a championship fight. That’s assuming Edgar is even interested in jumping weight classes, of course. “No, I think Frankie would have to fight somebody at [145 prior to competing for the title there],” White stated at the post-fight press conference. “We’ve got that thing backed up, we’ve got all these [divisions] backed up for titles right now. That one’s backed up. And if I know Frankie like I do, I’m sure he’s gonna want to go down there and fight [for the belt] right way. Despite his vast accomplishments in the 155-pound division, White hasn’t been shy about pushing Edgar to shed 10 pounds and competing in a more natural featherweight class. While his feelings have not changed, White isn’t about to force Edgar’s hand. Edgar has experienced great success at lightweight – which includes capturing the belt from, and then defending it against, BJ Penn, the man most consider to be the division’s GOAT – so it’s understandable why he has resisted the transition. Although, now that he won’t get another rematch against Henderson and will have to work his way back up a deep lightweight totem pole, this might be the perfect time to swim in a new pond. On the flipside, many believe he beat Henderson last night and should be toting the hardware again. So from that standpoint, it’s tough to say Edgar should leave a division that he could very well be the champion in.